I'm all over this one. Awesome, 1st car I ever raced on track was a Turbo Optima mid Se, but close enough. Gold shock availaiblity is awesome. What is the difference between this and the Optima? Seems the Optima, Javelin, Turbo Optima, and Optima Pro all used the same chassis. From the limited pics here, looks like sway bars, gold colored dampers, tire diameter, and of course the body are the only major differences. Please tell me those Gold shocks are exact replicas of the originals... my all-time favorite RC car shocks. The 2019 re-release however might not please everybody as the buggy features updated gold shock absorbers with threaded big bore shock bodies, something the purist might not like as the original standard bore shocks were of a clamping design with plain bodies. Awesome! Surprised given the dire financial situation at Kyosho, but extremely pleased. I really hope it sells well. I'll be buying my usual two kits. Which is a bit disappointing as there is really nothing wrong with the originals. In my experience they perform fantastically and are better than a lot of modern performance shocks. I guess if the Mid does come back then it will have these new shocks too. Wow, just realised they have fitted it with the Option House gold chassis parts too. This must surely mean that they will release gold nerf bars for the standard Optima too? This is looking like another superb re-release from Kyosho. The gold chassis is a very clever tactic to ensure strong sales of this one. Did Kyosho ever release a gold plated version of the Turbo Optima wheels back in the day? Looks like the article on dirt burners was thankfully wrong. The gold chassis is definitively a clever tactic. Like many others, I will buy the Turbo Optima for exactly this reason! @Wandy, I absolutely agree with respect to the original gold shocks. I have a vintage Optima Mid with those gold shocks and they perform very well! Anyway, I was always impressed by Kyosho's high quality parts. This I need this! I need something different and this might be it! In your opinions this or the Cat XLS? 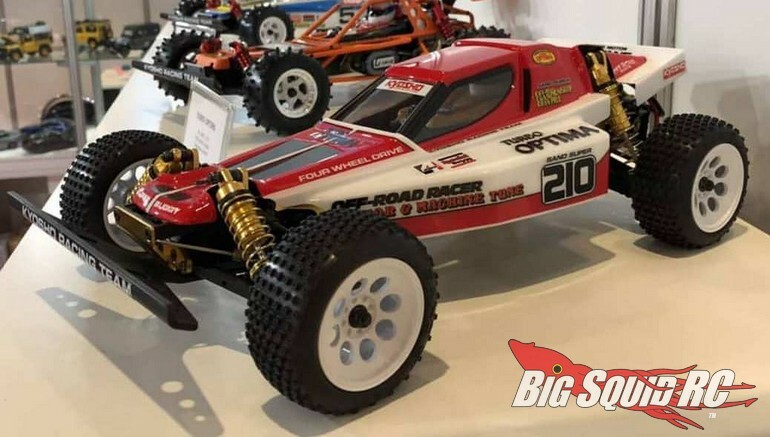 I wish Yokomo would release their old 4wd beast! Both. That's what I did! The original kit was fitted with the OT-66 tyres, right? The new gold plating does seem to be a different shade of gold to the original. It's early days of course with only a few photos of the new buggy....but based on the photos I prefer the original shade of gold to this new variant. Oh well, at least they made they effort.